Yesterday we have published a windows binary compiled from the latest code of the ccMiner 1.5-git SP-MOD fork of the Nvidia miner optimized for Maxwell GPUs by SP (source). However it had some issues present, like problem with the launch configurations for X15 on GTX 970/980 GPUs, but these were quickly addressed and are now fixed,s o we have updated our windows binary release. Since we also used the same fork of ccMiner in our Miner Control 1.5.5 Pack for Nvidia GeForce GTX 750 Ti also released yesterday, we have also included the new fixed windows binary in that package. So if you have downloaded it today you should re-download it again as the latest source code includes some other fixes and improvements as well. In terms of performance improvements, you will probably not see such as compared to yesterday’s windows binary, but if you are using an older release you should notice significant performance increase. Time for another windows binary release based on the latest code of the ccMiner 1.5-git SP-MOD fork of the Nvidia miner optimized for Maxwell GPUs by SP (source). Since the last windows binary we have published a few days ago there have been a lot of fixes and improvements made to the code and we were pleasantly surprised today to see a significant performance improvement. The results we are getting in terms of hashrate on our stock test GTX 980 GPU for X11 have gone up from about 7900 KHS with the previous release to over 8300 KHS and for X13 up from a bit over 6200 KHS to about 6700 KHS. There are also hashrate optimizations for other algorithms – NIST5 is up to about 26500 KHS, so performance should increase not only for X-based coins, so definitely a recommended update for owners of Maxwell-based Nvidia GPUs such as GTX 750 series and GTX 970/980. There seems to be a bug with the launch config of X15 for Computer 5.2 cards as on GTX 750s it works fine, also the improvements are also present for GTX 750 and GTX 750 Ti users, but the hashrate increase is not so big. Do note that this fork of ccMiner is supports only Maxwell cards as it is optimized and compiled for Compute 5.0 and 5.2 architecture. We have compiled a windows binary from the latest code of the ccMiner 1.5-git SP-MOD fork of the Nvidia miner optimized for Maxwell GPUs by SP (source). This miner includes the latest features available from tpruvot’s fork of ccMiner such as extra nonce support, however the main difference is that it is a version designed to provide the maximum performance on Maxwell-based Nvidia GPUs using Compute 5.0 (GTX 750, GTX 750 Ti) and Compute 5.2 (GTX 970 and GTX 980). 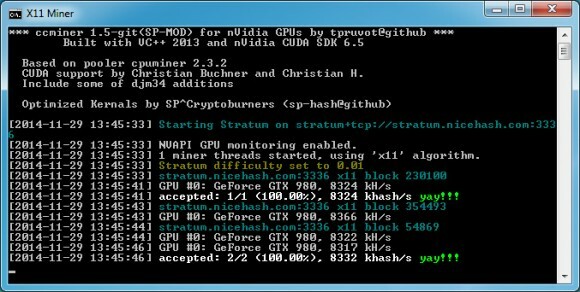 If you are using an older Nvidia-based video card for mining crypto currencies you might want to stick with the tpruvot’s ccMiner fork that works with cards supporting Compute 3.0 or newer. The optimizations by SP do provide some extra hashrate and our test has shown a bit higher performance as compared to the latest code from tpruvot, testing with GTX 980 at stock frequency on X11 algorithm we are getting about 7900 KHS or slightly faster with the SP fork. The windows binary was compiled from the latest source with VS2013 and uses CUDA 6.5,s o make sure you have the latest video drivers installed.